Someone brought this wonderful pile of memorabilia to CCCKC last week. 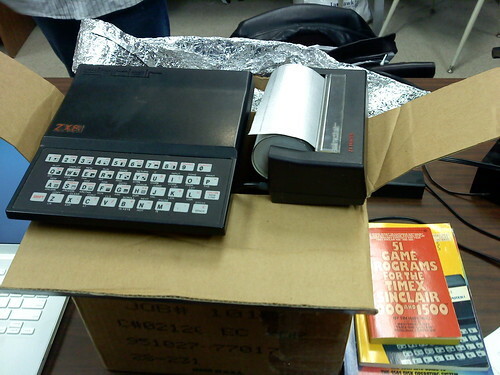 This is a Sinclair ZX81. It was introduced to England in 1981. It was a Zilog Z80-powered entry-level computer that used a cassette tape (remember those?) for storage of data, and hooked up to a TV for a monitor. The ZX81 used the european PAL standard, so this machine won't work on normal analog TVs here in the US. The ZX81 features a whopping 1kB of built-in RAM, and a CPU clock speed of 3.25 MHz, or for you kids out there that don't know what a kB or a MHz is: It had about 0.0000001 GB of RAM or about 1,024 characters, and ran at 0.00325 GHz. It could be purchased pre-assembled, or in kit form, which required soldering. 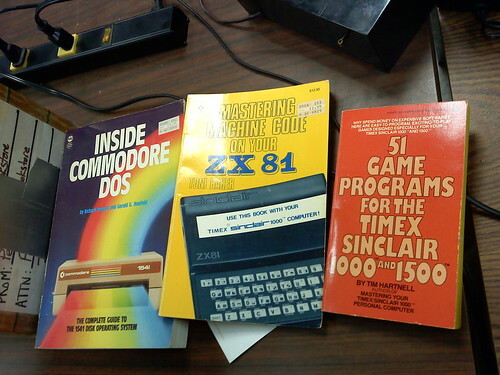 The version that made it stateside -- the Timex Sinclair 1000 -- was my very first computer. It was a slightly modified version of the ZX81. Mostly, it featured twice the RAM (still not enough to hold the typed text from a single page of a paperback book) and an NTSC modulator that was compatible with our television sets. Graphics were mostly block characters on the screen, and if you wanted a program with much power behind it, you had to use Z80 assembly language, if for no better reason than more efficient use of the RAM. My Sinclair died sometime in the early 90s. It still powers on (if I can find it) but the membrane keyboard's ribbon cable became brittle and broke, mostly due to the heat sink inside that sits very close to... well... everything, since the machine itself is so tiny. I'm wondering if I could get away with using my small portable "watchman" style pocket TV as the monitor and a voice greeting card to store a program or two. I have a few ideas about fixing the keyboard's ribbon cable. If I can unearth my old Sinclair, I'll see if I can get it fixed up. Until then, I'll just gawk at these pictures and remember with fondness the days that kick-started my interest in computers. What was your first computer? Do you still have it?